Mushrooms. Think about it. Mushrooms appear in your lawn, on a log, under trees, on trees. Little brown ones, shelf-like orange ones, white speckled red ones . . . many, many different kinds. 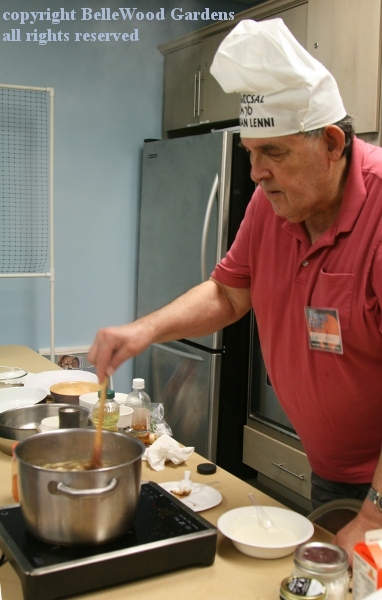 Members of the New Jersey Mycological Association are fascinated with mushrooms. They think everyone else should be fascinated too. 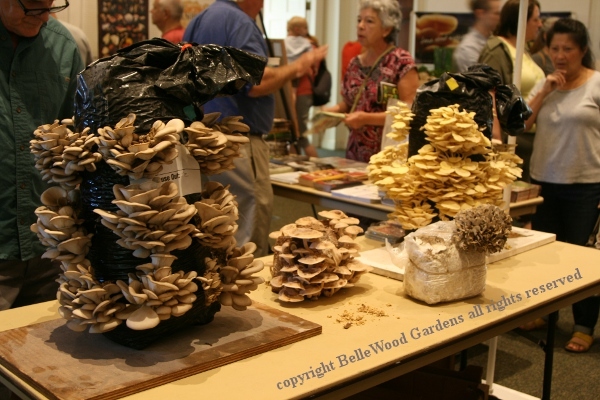 So once a year they offer a Fungus Fest at the Frelinghuysen Arboretum in Morristown, filling the auditorium with all sorts of informative displays. The two downstairs classrooms are also well worth visiting. at certain times, someone demonstrates how to do this. of edible mushrooms, both cultivated and wild foraged. It is important to identify what you forage. Mistakes can have unfortunate consequences. 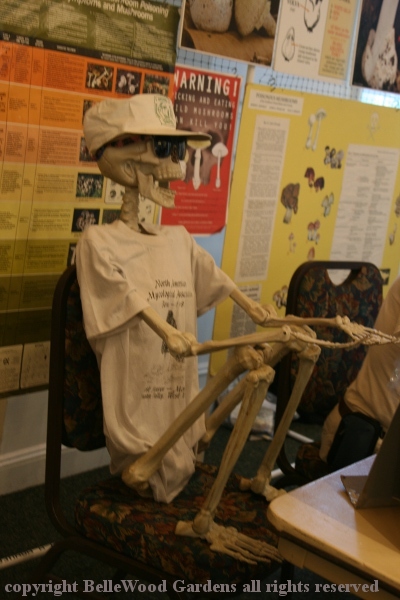 At Fungus Fest one whole end of the auditorium is dedicated to identification. 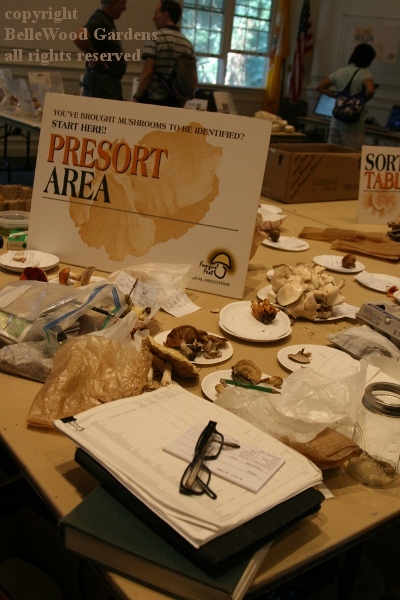 People are encouraged to bring their mushroom-y discoveries to the Pre-Sort area. Some are easy to i.d., others more difficult. But they will, in the end, be named. 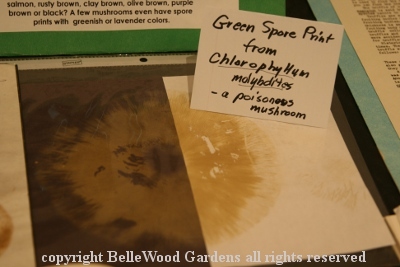 Spore prints are one aid in identification. 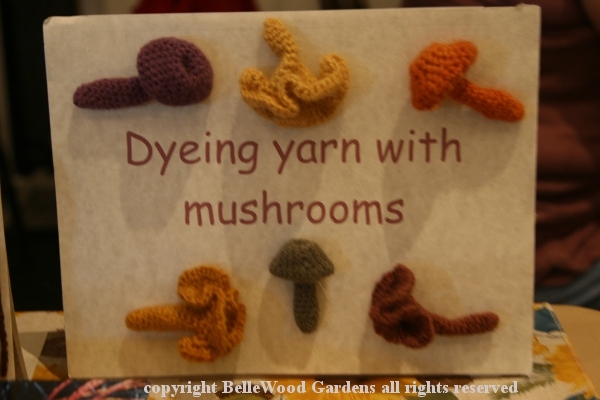 Some mushrooms are quite suitable for crafts. 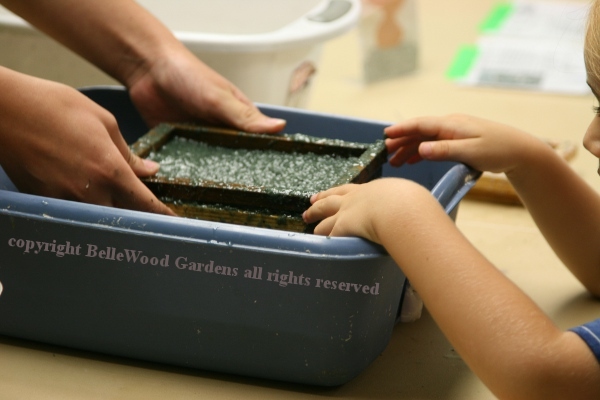 Children especially enjoy paper making. It's somewhat messy . . .
to lavender, but the yellow to orange to red orange are pleasing too. 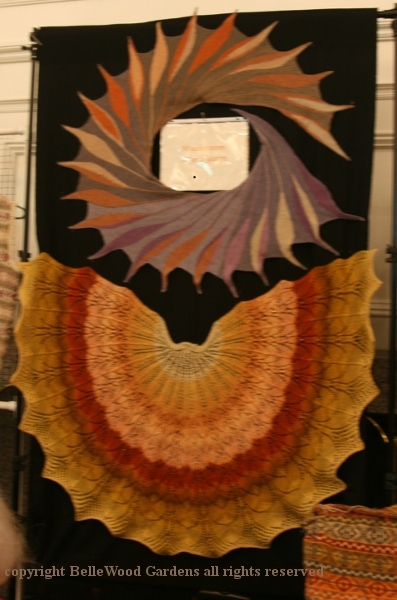 and two exquisite shawls, their yarn mushroom dyed. 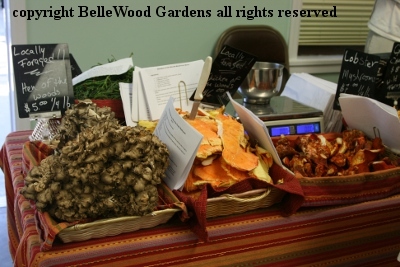 Many members of the New Jersey Mycological Association are passionately interested in any fungi, edible or not. I am what they refer to as a "pot hunter" because I only care about deliciously edible mushrooms I might forage for, here in New Jersey. But perhaps I am not alone. 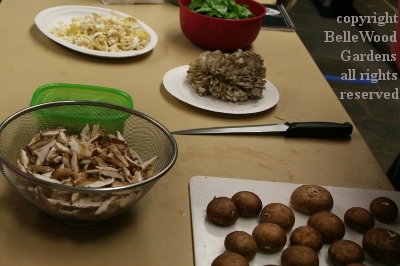 A popular Fungus Fest event is mushroom cooking, with tasting samples. 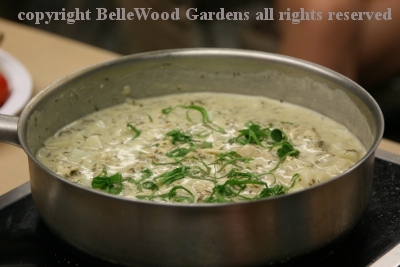 a pot of delicious soup: vegetable stock base with shiitakes, carrots, celery root, and cream. Mushrooms cleaned, prepped, ready to cook. 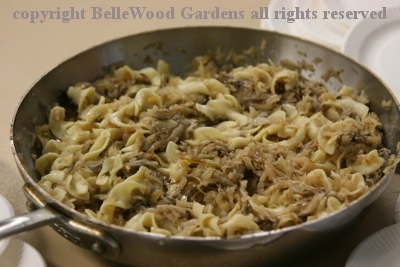 with braised cabbage and noodles. 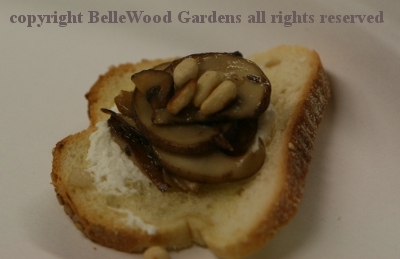 lightly toasted pignoli, sautéed shiitake and cremini. 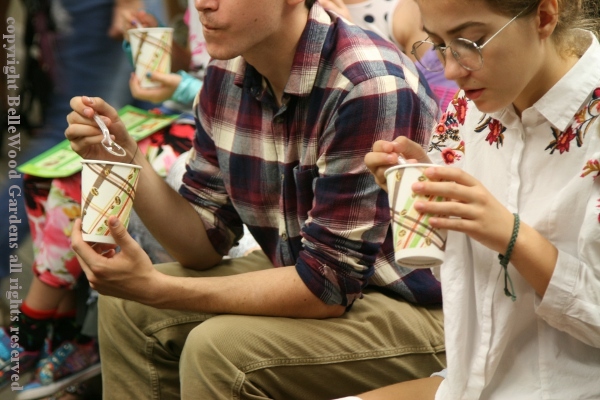 The throng of taste testers each got a generous spoonful or so of each dish. 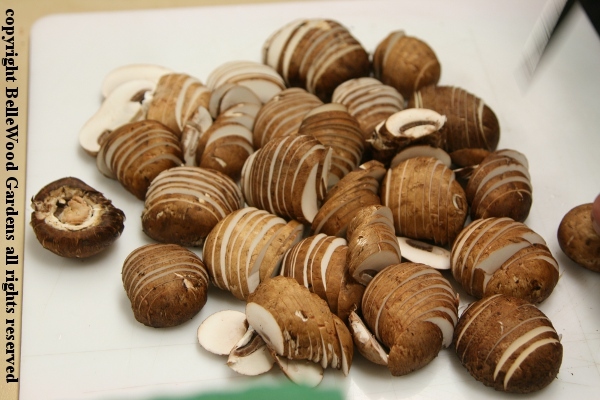 Fresh cremini are lovely mushrooms, readily available at the grocery store. Start with these. 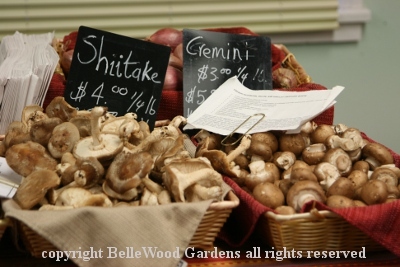 Explore other cultivated mushrooms such as shiitake, king trumpet, and more. Join the New Jersey Mycological Association and learn to forage - safely - in the wonderful world of wild mushrooms.